With inequality on the rise, global debt higher than ever and international tensions intensifying, the political backlash to the crash of 2008 has only just begun. This weekend marks the tenth anniversary of the collapse of Lehman Brothers, the once-mighty US investment bank whose dramatic bankruptcy on September 15, 2008 unleashed the worst financial crisis since the Great Depression of the 1930s. A decade on, we commonly hear the complaint that little has changed since then: the banks are still too big to fail, finance continues to dominate productive activity, and ordinary households are yet to feel the impact of a sluggish economic recovery in their pockets. But this perceived continuity, while certainly valid, is only part of the story. In reality, a lot has changed over the past 10 years – much of it, unfortunately, for the worse. In the years before the crash, the world still reveled in a credit-fueled state of complacency. During this so-called Great Moderation, UK Chancellor and later Prime Minister Gordon Brown even infamously boasted that the endless boom and bust cycles of the past had finally been mastered and overcome. From now on, there would be no more financial crises. This false sense of calm has long since given way to intensifying economic, social and political turmoil. Looking back, it is clear that much of this turmoil can be directly attributed to the disastrous way in which policymakers responded to the 2008 crash. As governments across the globe bailed out their biggest banks and assumed the liabilities of the financial sector in a desperate bid to keep global capitalism from imploding under the weight of another Great Depression, they effectively transformed a private banking crisis into a sovereign debt crisis. From 2010 onwards, they then responded to this self-inflicted sovereign debt crisis with a policy of extreme austerity, rapidly slashing public expenditure to repay private bondholders – who often turned out to be the same financial institutions that had been bailed out with taxpayer money in 2008. 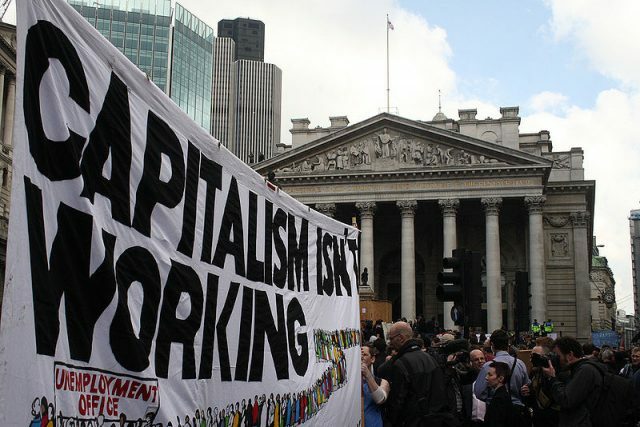 This neoliberal approach to crisis management – privatizing the bankers’ profits and socializing their losses – in turn intensified a long-standing trend towards growing socio-economic inequality. Faced with decimated welfare benefits, rising unemployment and stagnant or falling real wages, many households had little choice but to take on even more debt just to cover their basic expenses. As we now know, the gospel of fiscal austerity was to find its most passionate preachers in the European Union, where the zealous embrace of budget cuts and the resultant fall in aggregate demand led to a lost decade and several violent bouts of market panic that nearly brought down the Eurozone. Nowhere were the catastrophic consequences more painfully felt than in Greece. Placed under the tutelage of its creditors, the country slashed public spending and underwent a collapse of economic output and popular living standards worse than that experienced by the United States during the 1930s. In Europe, as elsewhere, this economic devastation in turn fed into intensifying social conflict and political polarization. During this second stage of the global capitalist crisis, the fiscal troubles of the state were effectively transformed into a full-blown crisis of legitimacy. In 2011, the world witnessed the outbreak of mass protests fueled by a combination of acute political and economic grievances. Starting with the revolutions in Tunisia and Egypt, a wave of popular revolts spread throughout the Mediterranean Basin and the wider Middle East, profoundly upsetting the established regional order in the process. During the spring and summer, millions took to the streets of Greece and Spain in massive anti-austerity protests, directly inspired by the Arab Spring and in turn inspiring the Occupy Wall Street movement that would emerge in New York and quickly spread across the globe later that year. In 2013, similar uprisings convulsed Turkey and Brazil. The world was shaking. It was in the Arab countries, however, that these spectacular social mobilizations had the most far-reaching political consequences, overthrowing or destabilizing a number of entrenched dictatorial regimes before collapsing into sectarian strife, counterrevolutionary terror and – most dramatically in Syria, Libya and Yemen – bloody civil war. Around the same time, a sudden outbreak of civil strife in the Ukraine brought Russia and the West to the brink of violent conflict. As historian Adam Tooze convincingly argues, these pre-existing tensions in the former Soviet sphere were also dramatically exacerbated by the economic fallout of the 2008 crash. Meanwhile, as the social and political consequences of the crisis began to make themselves felt, and the postwar international order seemed to tremble on its foundations, the world’s leading central banks – adamant to save the skin of private financiers and avoid a repeat of the 1930s – responded with an unprecedented monetary experiment. Not only did they drop interest rates to historic lows, but they also embarked on an aggressive program of “quantitative easing” (QE) that would see the four biggest central banks pump the equivalent of $15 trillion in new money into the global financial system. Instead of boosting productive activity, however, it soon became clear that this excess liquidity had unleashed a fresh wave of speculative investment. As a result, new financial bubbles blew up left and right: in real estate, in stocks, in student and car loans, in corporate bonds, in emerging markets – anywhere where such investments appeared to yield a decent rate of return. Apart from fueling the longest bull run in US stock market history, the vast increase in global liquidity also powered a renewed international lending boom that caused global debt to shoot up to 217 percent of GDP – its highest level ever, 40 percent above the danger zone reached on the eve of the crash in 2007. In short, policymakers and central bankers set out to resolve a crisis caused by far too much debt – with even more debt! In the absence of sufficient productive investment, this was always going to be a recipe for disaster. The unintended side-effects are already starting to make themselves felt in emerging markets like Turkey and Argentina, which borrowed heavily in dollars during the QE-fueled boom, leaving them particularly vulnerable to an external economic shock. Now, as the US Federal Reserve unwinds its QE program and prepares to raise interest rates, capital is beginning to flow back from emerging markets to the United States, causing growth in the Global South to slow and the US dollar to strengthen in the process. If it persists, this lethal mix of slowing growth, rising interest rates and a stronger US dollar will steadily undermine the capacity of emerging-market borrowers to repay their dollar-denominated debts, likely leading to renewed investor panic. Although the world economy will probably be able to withstand a series of isolated emerging-market crises, there is one country whose towering debt load would, if it were to implode, pull the rug from underneath the global recovery. That country, of course, is China. While China’s debt is mostly domestically held, its enormous credit expansion of the past decade must surely rank among the most extreme in history. Total debt is expected to reach 327 percent of GDP by 2022, double the level of 2008, placing global capitalism’s industrial powerhouse among the most heavily indebted economies in the world. The explosion of credit fueled an unparalleled construction boom that saw China pour 45 percent more concrete into its cities in three years than the US had consumed in the entire preceding century. It proved to be a shot in the arm for commodity-exporting developing countries, and it certainly helped keep global capitalism on the rails after 2008. But the same credit-fueled boom also led to massive over-investment, leaving behind vast ghost cities and enormous surplus capacity alongside a gigantic $10 trillion shadow banking sector. Some fear that this “mother of all bubbles” may yet blow up to unleash a major financial cataclysm further down the road. Even in the absence of such a disaster scenario, however, the combination of a Chinese growth slowdown and the end of monetary stimulus in the US is already having far-reaching repercussions elsewhere in the world. The fallout has hit Latin America especially hard, causing its “Pink Tide” of progressive governments to rapidly recede in the face of worsening economic conditions. Brazil, for one, by far Latin America’s largest economy, has recently been battling its deepest and longest recession in history. This steep downturn has gone hand in hand with intense political instability, leading to a right-wing “constitutional coup” against president Dilma Rousseff and leaving former president Lula in prison on corruption charges, forcing him to pull out of next year’s presidential race. Similar turmoil has beset both Maduro’s socialist government in Venezuela and Macri’s neoliberal government in Argentina, highlighting the structural nature of the crisis, which is striking vulnerable countries irrespective of the ideological orientations of those in power. The most consequential political tumult of all, however, is undoubtedly that rocking the old capitalist heartland of the European Union and the United States. There, from 2016 onwards, years of austerity-induced mistrust, decades of globalization- and financialization-driven inequality, and centuries of glorified racism, nationalism and misogyny have finally culminated in a parallel political showdown unmatched in postwar history. On one side of the Atlantic, the isolationist wing of the UK Conservative Party, ever-nostalgic for the long-gone glory days of the British Empire, is threatening to storm out of the European Union without a proper exit deal, risking untold damage not only to its own economy but also to jittery global financial markets. Similar reactionary forces are now making serious electoral inroads across the continent, raising the specter of a potential disintegration of the EU. On the other side, meanwhile, US President Donald Trump appears to be trying to do everything in his power to undermine the stability and future viability of his own administration. Yet despite the seemingly interminable succession of scandals and controversies, he retains control over his Twitter account and the reins of foreign policy, allowing him to stoke international divisions and geopolitical tensions amidst an escalating trade war with China. The immense uncertainty generated by this intensification of domestic and international political conflict is in turn having a depressing effect on the global economic recovery – which on its turn is bound to feed into even greater political chaos elsewhere, setting off a vicious cycle of self-reinforcing disorder. In short, the global firestorm unleashed by the collapse of Lehman Brothers ten years ago has by no means subsided. Not only are the consequences of the financial crash still with us today, in the form of widening inequality, rising debt and crippling political instability, but the crisis of capitalism itself also persists and continues to wreak havoc across the globe, constantly changing shape as it makes its way from one disturbance to another. Luckily, however, not all social and political change since 2008 has been for the worse. The same destabilizing dynamics that brought the world Trump and Brexit have also opened a previously unimagined space for politics – including a different kind of politics committed to a radically democratic and truly emancipatory alternative to the present global disorder. This new radical politics first showed its face in the global uprisings that rocked the established order from 2011 onwards. It has recently begun to consolidate itself in the form of vibrant grassroots movements, progressive political formations and explicitly socialist candidacies that collectively seek to challenge the untrammeled power and privileges of the “1 percent” from below. Even in the midst of the Syrian civil war, the bloodiest and most intractable conflict to have emerged in the shadow of the Great Recession, in a region so often deprived of hope for a better future, the struggle for democratic autonomy by the Kurds and their allies has demonstrated the concrete possibilities of a revolutionary political project in these tumultuous times. At this point, it is still far too early to tell whether this emerging anti-capitalist politics of the twenty-first century will be able to succeed in the face of a powerful nationalist backlash. But if the dramatic events since 2016 are anything to go by, the political fallout of the global financial crisis is only just getting started. The real confrontation, it seems, is yet to come. Jerome Roos is an LSE Fellow in International Political Economy at the London School of Economics, and the founding editor of ROAR Magazine. His first book, Why Not Default? The Political Economy of Sovereign Debt, is forthcoming from Princeton University Press.